The insurance company/car-value-guide publisher’s newsletter also shared the unsold-vehicle statistics: At the Arizona auctions in 2015, 408 cars did not sell even though bidders were willing to pay a combined $69.5 million for them. In 2014, 494 cars went unsold at the Arizona auctions after being bid to $40.8 million. Basically, those figures indicate the difference between the consignors’ reserve prices on those vehicles and the fact that bidders didn’t think the cars were worth quite as much as those who already owned them. The folks at Hagerty did the math, figuring the average high bid on all of those unsold vehicles. Add… divide… and they discovered that figure had more than doubled when compared with 2014. For one thing, it does not mean that all of that nearly $70 million was left on the table at the Arizona auctions. Presumably, in very, very many cases, the person whose bid wasn’t enough to buy Car A simply waited a lot or two or a few and bought Car B. “All this suggests,” the newsletter reports, “that sellers are continuing to expect their cars to maintain stratospheric appreciation while buyers aren’t as bullish. The $40.44 million paid for the various pieces of the Ron Pratte collection likely is a record amount for a single collection sold at public auction. Until last Thursday, the most anyone had paid for a vehicle at an Arizona auction (including auction fees) was the $8.8 million that bought a 1958 Ferrari 250 GT California Spider at RM in 2014. On Thursday, a 1966 Ferrari 275 GTB Competitizione brought $9.405 million at Bonhams. But that car held the record for only a day. The following evening, a 1964 Ferrari 250 LM sold at RM for $9.625 million. Even though more than 400 cars were left unsold at the Arizona auctions, Bonhams (87), RM (89), Gooding (91) and Barrett-Jackson (99) each reported very strong sell-through rates. 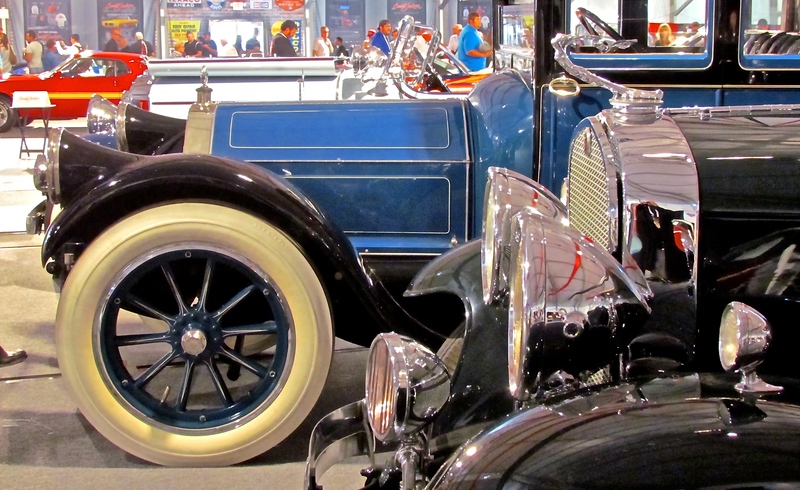 Pratte’s collection of automobilia and some 150 vehicles forced Barrett-Jackson to add days to its sale, which posted sales of more than $131 million in vehicles and an additional $6.55 million in automobilia. Barrett-Jackson said its 2015 automobilia sale at Scottsdale was a world record by nearly three times over. Of the $131 million in vehicle sales, more than $8.1 million was earmarked for charities, with another $600,000 also being donated by Barrett-Jackson bidders. The top three prices paid for vehicles at Barrett-Jackson all went to vehicles from Pratte’s collection: $5.1 million for the one-of-a-kind 1966 Shelby Cobra 427 Super Snake, $4 million for the 1950 GM Futurliner (a charity sale benefiting the Armed Forces Foundation), and $3.3 million for the 1954 Pontiac Bonneville Special Motorama concept car. 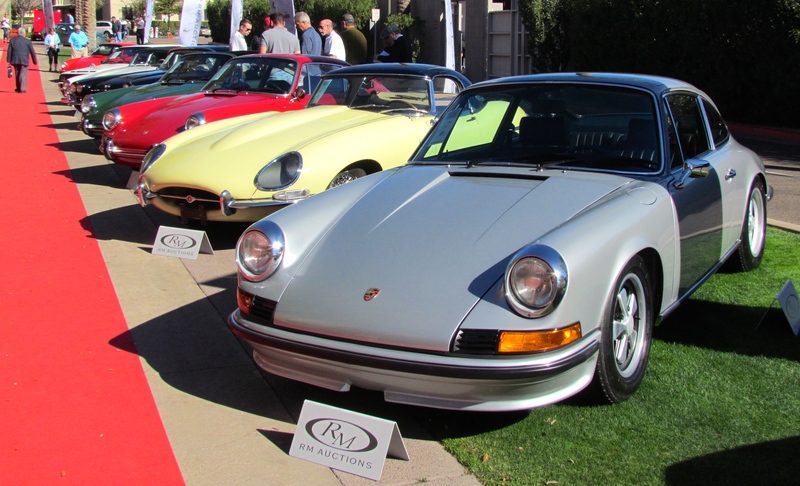 “Year on year, our auction here in Scottsdale has grown in both reputation and results,” James Knight, Bonhams group motoring director, said in a news release. Indeed, after its inaugural sale in Scottsdale sold only 40 cars in 2012 for less than $6 million, its numbers grew to 92 sales and $13 million in 2013 and to 85 sales for $23.5 million last year. This year, its 84-car Scottsdale catalog resulted in $25 million in sales. Bonhams news release did not include a top-10 listing, but it did confirm that a 1966 Ferrari 275 GTB Competition sold for $9.405 million to top a sale is a nearly 90 percent sell-through. Gooding & Company reported $51.1 million in sales of 114 of 126 lots and claimed 25 world-auction price records for various makes and models. It also pointed proudly to the sale of Jay Leon’s 2008 Dodge Challenger SRT8 that raised more than $565,000 for the USO ($360,000 for the car and another $200,000 in donations from bidders and others in attendance). Led by the Arizona record-setting Ferrari 250 LM, RM posted $63.7 million while selling 90 vehicles. Total sales were more than $18 million above those at the company’s 2014 Arizona auction. “Our 15th anniversary auction event was really everything we here at Russo and Steele could have hoped it would be,” said auction house founder Drew Alcazar. “We experienced record crowds this year, which spilled over into an amazing energy on the block and produced incredible results. “European sports continued to be the hottest segment this year, and we led the way across Arizona Car Week on “early” Mercedes-Benz 300SL roadsters with a result of $1,430,000.00 on an example from 1957 and with the very hot Porsche 911 market, we achieved the week;s highest result on a very special 1974 911 2.7 RS, which crossed our block at $302,500.00. Silver posted sales of $3.59 million on a very strong 69.5 sell-through rate. The company’s final report noted that unsold cars were bid to $1.9 million, including the high bid of the auction — $100,000 for a 1957 Dodge D-500 convertible that did not meet reserve. “We are anticipating a 50 percent increase in revenue going in to our spring Arizona auction on March 13-14, just from the momentum from the success of the last sale,” Silver added.